and why you need to secure your brand trademark for peace of mind. After all the hard work and dedication that goes into building your brand, you don’t want to see your original ideas used by someone else, or in the worst case, you copy someone else’s brand! The law does not require you to trademark your business, but it is an important protection for your business that gives you security and peace of mind over your company’s name and brand, logos and brand identity, and your brand positioning and taglines. The following are the 5 key benefits of trademarking your brand. The main reason for people trademarking their brands is to secure their name, logo, and slogans from being copied. Once you have your brand registered as a trademark, you can sue for infringement anyone who is unauthorised to use your creative property. It also deters other companies from using a similar name or logo. 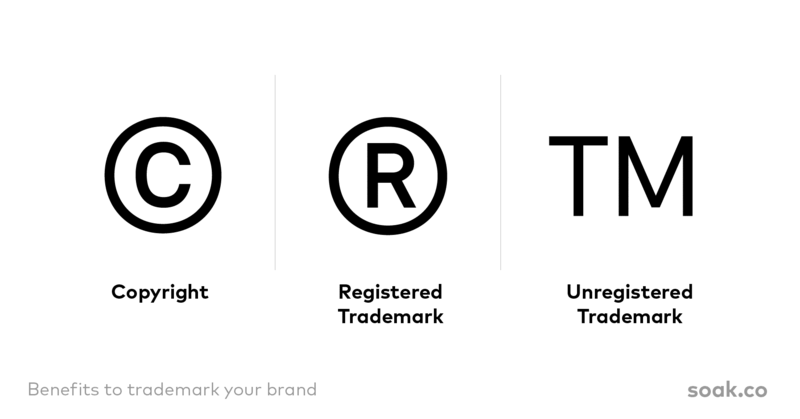 When you trademark something, you can put the restricted symbol next to your intellectual property. When others see this, they are less likely to take your ideas. This means you will stand out among competitors, and it will reduce the risk of confusing consumers with too many similar brands on the market. Not only does trademarking protect your own brand, but it protects you from getting sued as well. If you infringe on someone else, you could be in legal trouble. Your brand being registered can help protect you from a lawsuit, because you already went through a process to make sure no other companies had the same or similar name or marks. This saves you time and money. If you are accused of infringing on another brand, you may have to re-brand your entire company, which can confuse your customers. Also, re-branding is costly. You have to reprint business cards, redesign a logo, and change all your advertising and social media. A brand trademark company can help you with ensuring that your trademark is original. Search your trademark and make sure it is not already in use. This step is helpful in general when brainstorming names, slogans, and logos to assure they do not already exist or are being applied for by someone else. You can search via IP Australia’s Australian Trade Marks Search System. Go through a pre-application service like TM Headstart to help you figure out the chances of your registration being successful. This process takes about five workdays. Consult with a brand trademark service or agency to help you figure out how or what to register. Once you put in your application, it takes at least seven months for it to be approved, so the sooner you get it in, the better. This process costs starts from $250 in Australia, but the cost varies depending on the type of product or service. A brand trademark agency can help you figure out the cost, but it is well worth the expense for the legal protection and benefits. A trademarked name cannot be duplicated; a unique name brings web searches for your company straight to your website and social media. Increased website traffic is vital for a growing brand in the age of internet and social media. Having a name that is distinguished from the rest brings brand recognition and returning customers for your service or product. Trademarks don’t only apply to brand names, but also logos. Close your eyes and envision the first thing that comes to mind when thinking of big brands like McDonald’s and Disney. You probably thought about the McDonald’s golden arches, Mickey Mouse, or the classic Disney font. All these things go hand in hand with the brand, and create an immediate association. A unique trademarked logo can help create a strong association and lasting memory of your brand in the eyes of consumers. When looking for a product or service, they will have a bold mental image of your brand that speaks louder than words. Once you have a trademark in Australia, you can expand internationally. The World Intellectual Property Organisation (WIPO) can assign you with an international registration number. Expanding your trademark to other countries introduces your business to an increased audience. Also, brand logos have no language barrier and can be recognised regardless of language spoken. A trademark also helps your company expand to new products and services. Once consumers are aware of your name, logo, and slogans, they have a trustworthy image of your brand. This familiarity builds a relationship with customers where they will be inclined to purchase your good and services. For example, if there is a brand of crackers that you like, and you see that they started making cookies, even though you never tried them before, if you see their logo on the product, you’re more inclined to buy them. If you are interested in learning more about securing your trademark for your business, please contact us today. Soak Creative is a Brisbane brand agency that can help you get started on protecting your brand.